The "in" place to stay in Sweden's capital is Nobis Hotel Stockholm. It is a lively, social, yet dignified hotel with a see-and-be-seen air. The Nobis has great-looking contemporary style and is a member of the Design Hotels association. Nobis hotel opened in 2010 in the heart of Stockholm, Sweden. It is part of the Nobis Group, which operates several hotels and restaurants in Stockholm. 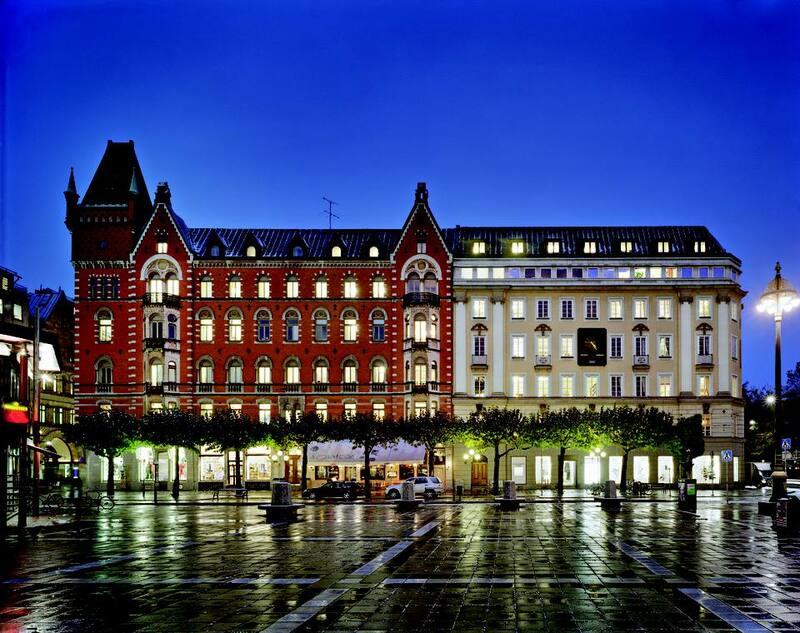 The hotel faces Norrmalmstorg Square in downtown Stockholm. This location is dead-center and extremely convenient. Is Nobis Hotel in Stockholm, Sweden Right for You? Who Stays at Nobis Hotel? The hotel attracts a stylish crowd, both leisure and business travelers. By the looks of them, many Nobis Hotel guests are professionals in the arts, fashion, and entertainment. The hotel's lobby, bar, restaurant, and stunning atrium lounge are vibrant with social life. In many ways, Nobis Hotel is an important-feeling, intensely social grand hotel. Nobis Hotel's rooms, however, are blissfully quiet. They are modern and comfortable, with ultra-cushy beds and spa-like bathrooms that feature large, inviting tubs. Nobis Hotel's buildings once housed a bank that was the scene of an infamous robbery in 1973. The event became known as Stockholm syndrome, in which the hostages came to identify with and side with the bank robbers. Nobis Hotel occupies two connected buildings dating from the late 19th century. • Nobis Hotel interiors are contemporary, but a strong sense of history remains. Nobis Hotel's 201 rooms are situated on six floors. Twenty-two deluxe rooms are 334 square feet, 10 one-room suites have 463 square feet and the grand Nobis Suite has 1055 square feet, with the potential to connect to two more rooms. Rooms are soothingly decorated in a white with touches of nature's tones, in rich dark-wood armoire, and gray rugs. The hotel's design firm, Claesson Koivisto Rune, based the palette on Stockholm's gentle, subdued winter colors. King beds, from the Swedish mattress-maker Dux, are firm and silkily dressed. A large flat-screen TV offers many stations, a computer screen, and an iPod/USB dock. The room safe can be confounding to use, but has electric sockets that charge your laptop. The armoire closet has a hanging area but no drawers. There is no place to unpack clothing that cannot be hung up. Bathrooms are clad in white Carrara marble. They feature a large tub with a spigot (but no shower). • A sleek Mac desktop in a nook off the lobby serves as a guest computer. Nobis Hotel is owned by a renowned Stockholm restaurateur, Stefano Catenacci. Dining is a high point here. Guests (and locals) can choose from several dining options. These include Caina restaurant, which is pan-Italian; 24/7 Bistro, The Gold Bar and The Lounge. Nobis Hotel's Swedish buffet breakfast features Scandinavian specialties such as smoked fish and reindeer, fresh berry juice, creamy oatmeal, and strong coffee. The Gold Bar features stylish cocktails concocted by a New York expat mixologist. The Lounge, which the hotel calls "Stockholm's new living room," is a busy meeting place set in an imposing atrium. Room service is 24 hours. The fitness center at Nobis Hotel is free to guests. It is compact but fully equipped, with a white marble sauna area with a dry sauna and a steam sauna. The fitness center is daylight-lit and has views of the hotel's impressive interior atrium. Spa treatments may be ordered in-room; treatment rooms are planned down the road. Service at Nobis Hotel, Stockholm is provided by bright young men in trim, stylish suits. They are efficient, welcoming, and as warm as you have any right to expect in Scandinavia. Housekeeping is flawless, and public areas of Nobis Hotel are spotless. As is common in the travel industry, the Luxury Travel Expert was provided with a complimentary visit for the purpose of describing the hotel. For details, see our site's Ethics Policy.